This was a wonderful place in Scio, Oregon called J&J's Antiques. Inside was full of vintage surprises, but it was the outside area garden and barn that I fell in love with. I imagined living there in Oregon and visiting J&J's on the weekends to find things for my garden. 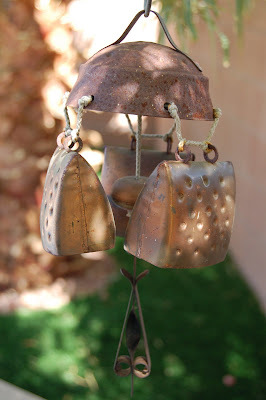 Now that I'm back home in Las Vegas I have an old wind chime I bought for $2.75 and these photos to remember my visit. Thanks for a fun visit J&J's! See you next time I'm in Oregon. settle for Boulder City for now. Just wanted to let you know that I think you are a very gifted photographer. You are blesssed with many talents. I'm officially jealous.